While the gallery is closed through the summer, please enjoy our Summer Window installation visible through the gallery’s front window. Saturday - Sunday: 11:00 a.m. - 5:00 p.m.
Crosstown Traffic, a new installation by Michael De Feo, is the seventh exhibition in Rice Gallery’s Summer Window series, which features works visible through the glass wall while the gallery is closed for the summer. 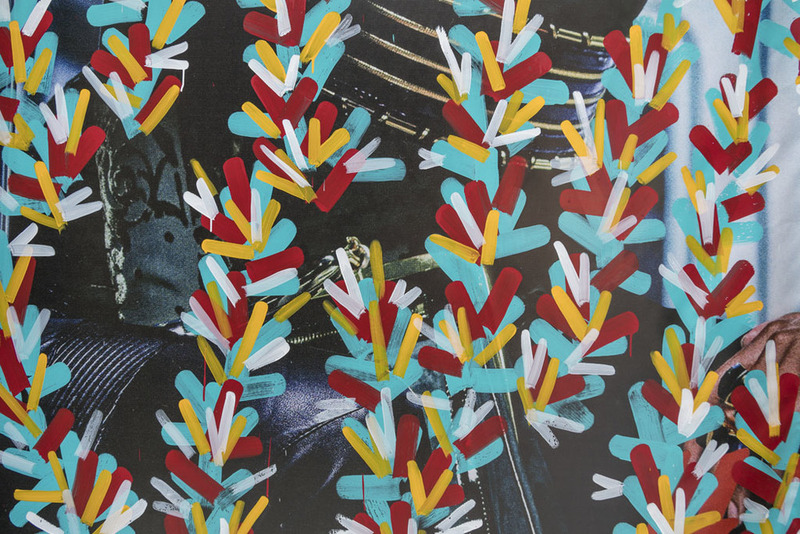 De Feo, who was profiled this spring in The New York Times, is a painter with a penchant for street art, gaining international recognition for painting over outdoor fashion ads with buoyant floral patterns. In Crosstown Traffic, De Feo treats Rice Gallery’s front glass wall like a supersized commercial display kiosk, enlarging a selection of fashion ads from magazines, printing them at nearly billboard size, and hand painting over them. As if a piece of Times Square or a large-scale storefront was transported to the gallery, the floor-to-ceiling imagery engulfs the viewer with ads for Balmain x H&M, La Perla, Coach, and Dior that De Feo abstracts and enlivens with pops of color and pattern. De Feo found a new way of inserting his work into the daily life of the city when in 2014, Public Ad Campaign, an international alliance of artists founded by Jordan Seiler that provides access to municipal infrastructure for public dialogues, gave him a key to open advertising kiosks at bus stop shelters throughout New York City. He removes the locked-away fashion ads, brings them back to his studio, and paints on them using bold strokes of bright color suggesting flowers. De Feo then returns the ads to different kiosks, completing what he calls a “quiet intervention” and an “unauthorized collaboration” with the company, model, photographer, and art director. The painted ads have been largely embraced by the fashion industry for their sensitivity, whimsical quality, and beauty, which has led De Feo to unforeseen opportunities: designing two covers for the April 2016 issue of the Neiman Marcus catalogue, THE BOOK, and designing his own line of scarves and wraps for Echo New York. Michael De Feo grew up in Rye, New York, graduating from the School of Visual Arts in Manhattan in 1995 with a degree in graphic design. He began installing his art on the streets in the early 1990s and in 1993 started his now iconic flower project. 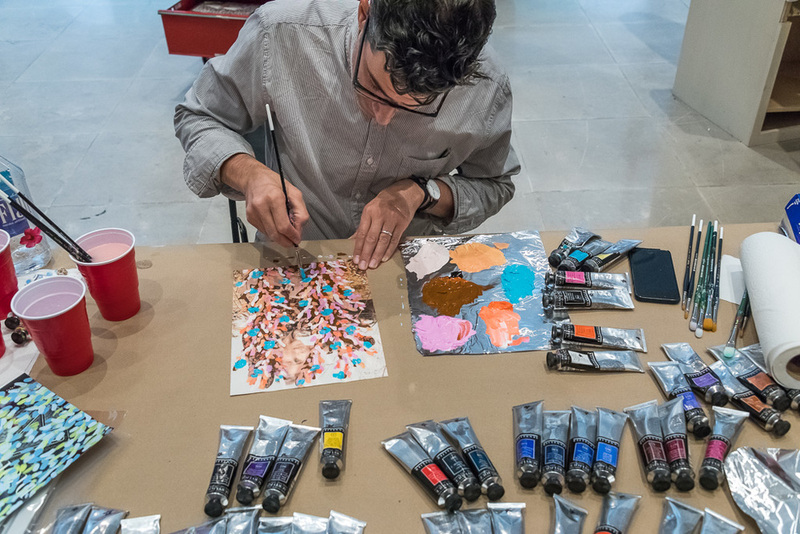 A Master of Arts in Teaching from Manhattanville College in Purchase, New York led to a job teaching art at Westhill High School in Stamford, Connecticut for 15 years, until he left in 2013 to pursue his artistic career full-time. De Feo’s work has been shown at venues including The Aldrich Contemporary Art Museum, Ridgefield, CT; MASS MoCA, North Adams, MA; Museo de Arte de Puerto Rico, San Juan, PR; The New Museum of Contemporary Art, NY; and StolenSpace, London, UK. He created a series of paintings for a line of women's accessories developed in partnership with Echo New York, which launched in March 2016. The products are available at Bloomingdale’s, Lord & Taylor, and echodesign.com. De Feo also created work for a promotional campaign for designer Christian Louboutin. Michael De Feo lives and works in New York. He is represented by Danziger Gallery in New York where he will have a solo exhibition opening July 13th, 2016.